With grim satisfaction I received the news. At last we were free. No more dancing to your tune. No more “yes sir, no sir, anything you say, sir!” No more running for cover. No stiff upper lip while you bullied and pummeled. You told everyone your boys were the toughest, the best. Fights were won in the schoolyard, or at home we’d face your fists. Excuses were for sissies. Such a little man; what made us think you a giant? When I heard you had died, I felt liberated! Happy! You’re still here, damn you. Note: This story is written in response to the “100 Word Challenge for Grown-Ups” at Julia’s Place. 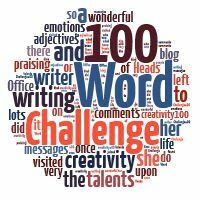 This week’s challenge is to write a 100 word story utilizing the phrase “at last we were free.” You can find the challenge here. This entry was posted in My Fiction and tagged 100 Word Flash Fiction Challenge, Abuse, Challenges, Family, Fear, Flash Fiction, Hatred, Julia's Place. Bookmark the permalink. Wonderful Kate. You always end these stories with such a punch. Something unexpected. Something that makes you go ‘Wow’. Haunting memories, bitterness and the like is deadly. Reading Diana’s comment and your response to her, I have to say YES! That’s just it. It may be pretty darn tough to get over it, but we sure can try. Try not to let it control and torment. Great, Kate, capturing that some shadows are too damn large to ever escape. Wow! “You’re still here, damn you. Inside.” This left me breathless. This is so true. The memory haunts, but that doesn’t mean a person can’t move on. Life is all about choices – to live with the goodness in life or to sink to the predator’s level. Those who can move to a positive outcome are the one’s who defeat the darkness. Well said, Michelle. I’ve read that many children who were abused grow up to be abusive. It must be hard to silence the voices of the past and to wonder if, deep down inside, if the same sort of person lives within. Hard – but with help and a strong desire to move past it, it can be done. Not easy though! We carry all our baggage inside. The mind is such a huge container that it can take-in so much and never purge….Brilliant Kate. Thanks, Nimi. I found your comment interesting. I think the character in this story will need strong therapy to get past his father – need help in purging or, perhaps more accurately, coming to terms with his memories. Exactly! The internal voices that we listen to can determine our present and our future, but only if we let them. I’m so glad you enjoyed the story, Belinda! What a powerful piece that fits so well in the world of politics/business/life. I am so impressed by what you can create is such a small space – a brilliant talent Kate, and it is great to see you using it so well. Another gem, Kate. Could lead to a great book about a sociopath! Hi Noelle, thank you. There’s a certain kind of father that’s just like this. This story was inspired by a memory of a childhood friend whose father was… shall we politely just say difficult? I don’t think you ever escape a person like this. We can escape our past, but I guess first we have to acknowledge that we’re carrying it around… inside. Lovely writing. You say so much with 100 words. I know people who still hear a negative parent’s voice inside his or her head. Even death doesn’t still that small, accusing voice. It takes a lot of fortitude and guts to get past something like that, and you have to admire people who do. When I left the east coast for the brighter disposition of the sun in the west (and all that comes with spurning cities uptight with cold, stress, and workaholism), I realized it isn’t where I go. It’s what I take there. I still met with challenges in this thing called living. Realized the problem was me, my response to them. That’s a powerful realization, Diana. So true for all of us! I’ve certainly found it to be true. Settings and situations may change, but perhaps not our responses to them – until we realize we don’t have to react the same way. There are no guarantees we can overcome our pasts, but we certainly ‘may’ if we try hard enough. This is it’s bang on. S.t.i.l.l. there. Inside. With the pain and the scars. Oh, this is good, Kate. Well done! You have quite a talent for these mini-masterpieces! This strikes a deep chord with me, Kate. It doesn’t matter if your tormentor dies or leaves your life, their presence inside your mind remains forever, like a wound that never heals. There's a special place in another dimension for people who delight in inflicting psychic or physical pain on those they were given the charge to guide, instruct, protect and love. And they deserve the punishment they get. And their children, those who overcome such painful pasts and who go on to have fulfilling and happy lives in spite of such harsh or cold treatment, deserve great credit. They are truly heroic because they had to find their own way. No child should have to go it alone. 🙂 Thanks, Bruce, for reading!